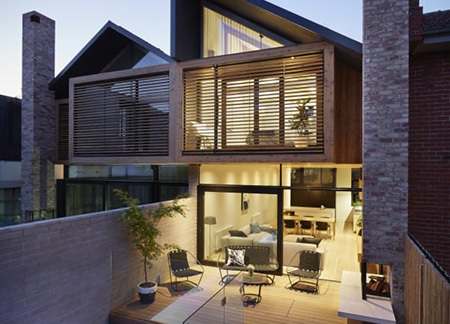 A fractured pitched roof holds together these paired, two-storey urban dwellings, a double-brick wall ensuring the privacy of each. The building’s bold geometric gestures and idiosyncratic symmetry – rendered in reclaimed bricks and cypress pine – shelter a citadel of calm within. A minimalist palette of American oak, pale expanses and glazed surfaces draws the various interior elements – including those of the adjoining loft-style studios and the custom-made cabinetry – into a single visual code. This pared back aesthetic coupled with dark framing elements and insertions demanded rigorous attention to detail during construction and finishing. With one residence larger than the other, a simpatico with balance was essential to pairing the dwellings and the dual structures that comprise each, presenting them as a single form. From building’s proportion, form and materials to the outside hearths, backyard pools and battened fence, it plays with the language of the humble bungalow, so crucial to Australia’s domestic heritage. But it also exemplifies distinctive design and construction, through which a humble tradition has been transformed into a singular vision for modern living.